As a complement to my previous post about my stats and the observation what an international phenomenon Blogging is; I just went through the stats for my blog again. 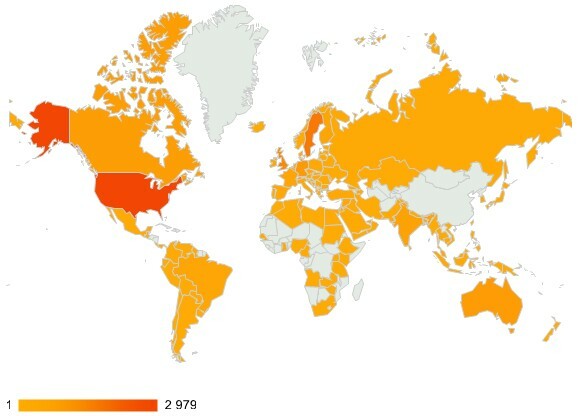 In the last three weeks, I had visitors from 127 countries. Including for the firs time visitors from Myanmar (Burma), Djibouti, Kazakhstan, Azerbaijan, Iran, Mauritius, Cameroon, Netherlands Antilles, Fiji, Cap Verde, Papua New Guinea etc. I am just so blown away by what a true and awesome international phenomena blogging is. It is so encouraging. Especially that a country like Myanmar (Burma) who have been controlled by a brutal military junta for the last 49 years with total censorship and control, is finally opening up. And as I said before, that’s why the powers that be fear the “free” internet so much. They have no control. And that’s why they do everything possible to regulate and stop it through various direct and indirect means.